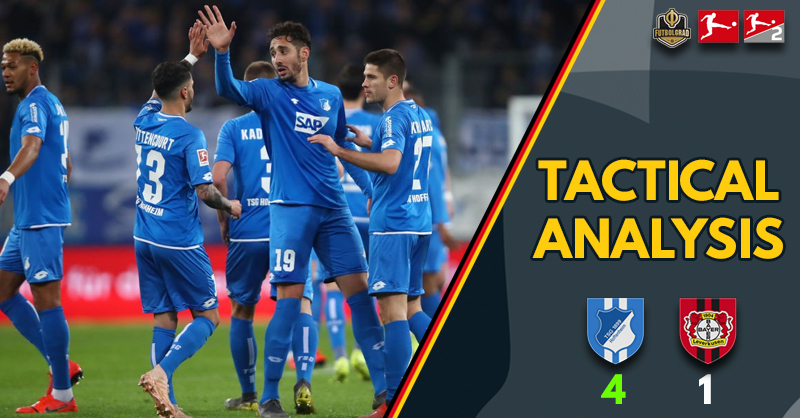 ProZone Arena – Hoffenheim v Leverkusen – It was once again a tactical masterclass by Hoffenheim head coach Julian Nagelsmann. Ahead of the game, Hoffenheim bench boss had praised the playing philosophy of Bayer Leverkusen’s head coach Peter Bosz. 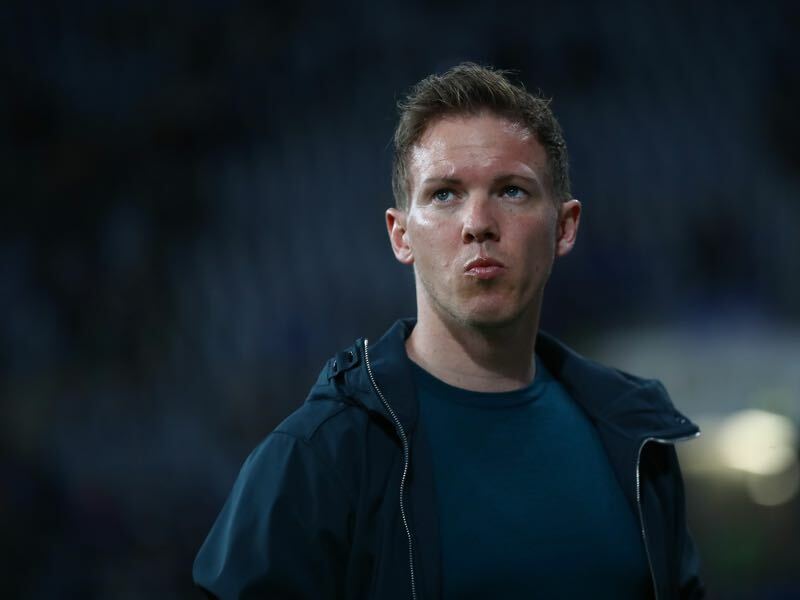 But a few tactical changes to Hoffenheim’s squad saw Nagelsmann come out on top in what ended up being a lopsided affair. It was almost an old-school 1990s Football Manager 4-3-3 formation that Nagelsmann opted for to start the game. The 31-year-old head coach fielded three natural strikers in Ishak Belfodil, Andrej Kramarić and Brazilian Joelinton. All three are physically imposing forwards – even if Kramarić only measures 177cm – and not natural wingers. Playing the three up front was not necessarily new – Hoffenheim often operate in a 3-4-1-2 formation this season – but what was new was playing essentially with three central forwards on top of a 4-3-3 formation. The trick worked for Hoffenheim. Leverkusen, who were struggling with wide players, found it difficult to man-mark all three strikers and although overall the two teams were relatively even matched – Leverkusen, in fact, had 65% ball possession – Hoffenheim saw all four of their shots on target go in, whereas Leverkusen had only one of their five shots on goal cross the line. Once again Peter Bosz appears to rely on an all-out attack. The sort of system that saw him quickly exposed at Borussia Dortmund. Leverkusen, it appears, wants to score their way out of problems. That tactic, however, only works when being effective in front of goal. Die Werkself, in fact, dominated every aspect of the game, bare shots on goal and actual goals. Aside from the 65% ball possession Leverkusen had more corners (7-4) shots inside the box (12-9) and passes (632-340) and was also better in pass completion (86% vs 76%). But Bosz high attacking line with Julian Brandt playing a Kevin de Bruyne role in central midfield was left exposed by Hoffenheim’s explosive strikers, that seemed to score at will and even poached goals off each other. The statistics highlight that Bosz is of the old Ajax school. He preaches spectacular football that leaves the backline exposed and is gorgeous to watch when played effectively. But the strategy heavily relies on being able to outscore their opponents and all parts working throughout the 90 minutes. Bosz was certainly outfoxed, but his system also relies on having all parts working for the full 90 minutes. Hence, how much did early changes play into this one? It certainly did not help that Bosz was forced to bring on Charles Aranguíz for Karim Bellarabi (26′) and Mitchell Weiser for Lars Bender (36′) before halftime. At the time of those two changes, Bayer were still in this game with the score even at 1-1. But with Bellarabi off Brandt was pushed further up the field, which strangely enough exposed the weaknesses in Bosz’s fragile 4-3-3 system. Leverkusen’s Brandt was now found further up the field where he was supposed to fill the void left by winger Bellarabi but at the same time was still mostly active in the centre of the park. Right behind him, both Aranguíz and Julian Baumgartlinger were now operating in defensive midfield but Aranguíz, in particular, failed to fill Brandt’s dynamic midfield role and allowed Hoffenheim to press forward in the transition game. How much did the changes impact the result? They certainly played a factor, but on the other hand in any other key statistic Leverkusen remained dominant, and Nagelsmann may have exposed merely the very obvious weaknesses in Bosz’s all-out attacking style as Leverkusen have now conceded ten goals in the last three games.